Lochie is talking about Mother's Day with a glum Toby. 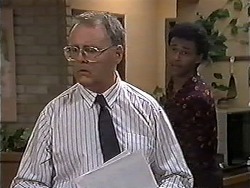 Kerry comes in and stands unnoticed in the background as Lochie asks if he's going to give the Mother's Day gift he made at school to Kerry. Toby wishes he could give it to his real mum and he strongly denies Kerry's his mum now. Eddie has a new lamp and is eager to try it out. Once he's gone Harold and Madge realise he hasn't been looking for alternative accommodation and it might be a good time to have a word to him about it. Sharon reminds them that they said the same ages ago but Madge says he gave her some presents and she couldn't do it. They agree something must be done and Madge thinks Harold should be the one to do it since he has a way with words. Harold reluctantly agrees to chat to him tonight. 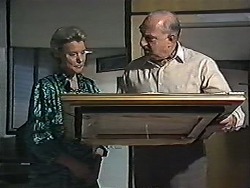 Jim is surprised to find that Helen is returning the painting to its rightful owner, Derek Wilcox. Although it hurts, Helen knows it's the right thing to do after her chat with Paul this morning about him deceiving Joe Mangel. Kerry is pleased to hear Joe has the job. She tells him about Toby missing his real mum and thinks that maybe they can use the situation to help Toby come to terms with Noelene's death. Joe thinks anything is better than watching him bottle it all up inside. Harold is annoyed that Madge has taken so long in the bathroom and reminds her they have to address a meeting in less than an hour! Eddie remarks to Sharon about Harold's patience and Sharon says he's been especially patient when it comes to letting Eddie staying on with them. She asks if he's been looking for somewhere. He admits to her that he hasn't enough money to rent a shoebox right now – most of his income is going to pay off debts back in England. Sharon just wanted to warn him. Eddie knows there's a way to solve this – he just has to think of it. Joe is dismayed about the price of plants. He might have to end up paying Paul for the privilege of having him work for him! Joe says that they were thinking he could give his to Noelene. They could take it to the cemetery and put flowers in it. Toby gives an unenthusiastic ‘I guess so', before running off to watch TV, leaving Kerry looking concerned. 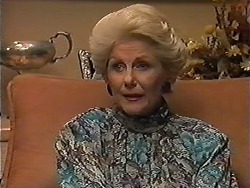 Helen returns, having been unsuccessful in her search for Derek Wilcox. He's in hospital and not at home as she'd thought. She asks Jim is he's thought any more about the marriage guidance counselling. Jim offhandly says he'll go – Bev hasn't left him much choice. Helen thinks it'll be a waste of time if he thinks it won't work. Jim doesn't think he can change his attitude but Helen thinks he can; if not, he should give up right now. Jim promises to give it a good go, sounding more enthusiastic. After all, what's he got to lose? Helen smiles, thinking that's more like it. Kerry arrives with Rowena and Dawn, some women from a women's refuge. They want to know what she's going to do to help. Madge falters when she admits she didn't know where the shelter is. Dawn points out that they've had so many people come to them, full of good intentions that come to nothing. They outline what happens at the centre and Madge is shocked to discover underfunded they are. Plus the rent's gone up twice! Dawn asks if she thinks she can help them. Helen locates Derek Wilcox. She presents him with the painting and he's astounded. He asks her to stay for coffee and cake so she can tell him about how she came to have it. EDDIE (to HAROLD): For a man! Dawn recounts the things his supporters have done to shut them down and Harold has to leave, trusting the meeting will be over when he returns. Kerry is making jewellery when Harold blusters in, hoping she's happy about him being kicked out of his own home by revolutionaries! He knows she's responsible for Madge being in conference with ‘those two terrorists' from the women's refuge. She doesn't know Madge like he does – a little knowledge is a bad thing when it comes to her! Kerry is appalled; she can't believe how ignorant and small minded he is. He has no right to talk about things he has no idea about. He talks about being Christian and helping people when Dawn and Rowena are getting their hands dirty in the community! He has to have a look at himself or *two* people won't be speaking to him; his wife *and* his daughter! Joe doesn't say a thing as Harold bumbles about in confusion at the whole episode. Madge thinks Rowena and Dawn were amazing and Sharon agrees. Harold arrives home and Madge apologises for earlier. Eddie is looking at Harold's election leaflets. Madge wants to have a look and Harold is too downhearted to argue otherwise. 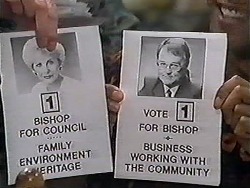 They present both their leaflets at the same time and both are remarkably similar; ‘Vote For Bishop' with some nice promo photos at the top (in black and white of course, this was the nineties.) Harold is annoyed at the two appearances of Bishop on the voting form and Madge decides to have hers reprinted with ‘Ramsay' instead. And since it was an oversight, she's sure he won't mind footing half the bill. Harold is not chuffed. Helen and Derek talk about art, finding they both have similar views. Both muse it's a shame that only speculators can buy art these days. Derek is enjoying their conversation. Helen discovers Derek's been at the hospital for a month and should be leaving any day. She suggests he put the painting up in his room but he couldn't – insurance wouldn't cover it – and tells her to take it. Helen can't accept it. Derek knows she loves it and he is not a poor man, so doesn't need it for financial reasons. They come to a compromise – Helen will look after it until he returns home. She thanks him and promises to come and visit him again. 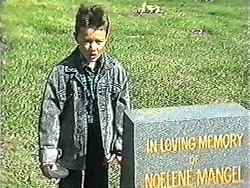 Joe puts flowers on Noelene's grave. He encourages Toby to give her the present he made but Toby is reluctant. Kerry gently encourages him to tell his mum he made it for her for Mother's Day. Toby yells that isn't true – he didn't make it for anyone! With that he throws it onto the ground and runs off.